Human endothelial cells (ECs) provide costimulatory signals sufficient to activate resting memory T cells to produce IL-2 and IFN-γ, at least in part through CD58-CD2 interactions. Recently, the B7-like molecule, B7-H1 (PD-L1), was described and shown to regulate T cell activation; however, there are conflicting reports on whether it stimulates or inhibits T cell cytokine synthesis. B7-H1 is not expressed constitutively by ECs; however, it is rapidly induced by IFN-γ, and synergistically by IFN-γ and TNF. In inflamed skin, B7-H1 is expressed by a subset of microvessels, and by keratinocytes, but is barely detectable in normal skin. Blocking the interaction of EC-expressed B7-H1 with its T cell ligand, programmed death-1 (PD-1), using a PD-1-Fc fusion protein, or by blocking B7-H1 expression with morpholino antisense oligonucleotides, augments expression of IL-2 and IFN-γ, implicating B7-H1 as a negative regulator of cytokine synthesis. However, signaling through PD-1 does not affect induction of the activation markers CD25 or CD69 on T cells, suggesting that its effects are specific to cytokine synthesis. The suppressive effects of B7-H1 on cytokine expression are proportional to the strength of the primary stimulus, allowing for B7-H1 to determine the level of T cell activation in response to ECs. Our results demonstrate that B7-H1 negatively regulates cytokine synthesis in T cells activated by ECs. The activation of CD4+ T cells is a key step in the generation of adaptive immune responses against invading pathogens. In humans, although probably not in mice, endothelial cells (ECs)3 can activate resting memory T cells to secrete cytokines and proliferate; and therefore, may play an important role in initiating and shaping recall responses in the periphery (1, 2, 3, 4, 5, 6). The two signal hypothesis of T cell activation is well-established and several costimulatory molecules have been identified (7, 8, 9). B7.1 and B7.2 are crucial for activation of naive T cells but appear to be less important for activation of memory T cells (10). Costimulation enhances TCR signaling and decreases the threshold number of TCRs that must be engaged for T cell activation to be triggered (11). In this sense, the expression of costimulatory molecules can set a threshold level of Ag at which T cells will become activated (3, 12, 13). This may be particularly important in the periphery for maintenance of tolerance toward self Ags. We and others have shown that human ECs lie along a spectrum of Ag presentation/costimulatory ability, with professional APC at one end, able to activate naive and memory T cells, and stromal cells such as fibroblasts and smooth muscle cells (SMCs) at the other, unable to activate either naive or memory T cells (3, 14, 15, 16). Human ECs lie between these two extremes and are able to activate resting memory T cells, but not naive T cells, and do so by promoting aggregation of lipid rafts on T cells at the interface with ECs (17). Human ECs do not express B7.1 or B7.2, but instead provide costimulatory signals through the binding of CD58 (LFA-3) on the ECs to CD2 on the T cells (18, 19). Human ECs have been reported to provide B7-dependent costimulation in trans (20). Mice lack the CD58 gene and instead use CD48 as a ligand for CD2; however, the affinities and cellular distribution of this family differ considerably between human and mouse, making mice a less than ideal model for this area of human immunology (21). Blocking Abs to CD2 or CD58 are not sufficient to completely block human EC costimulation, indicating the existence of alternative EC costimulatory molecules (22). Recently, a new B7-like molecule, B7-H1, was described (23, 24) and reviewed (25, 26). B7-H1 was found in an expressed sequence tag database search for homologous sequences to human B7.1 and B7.2 (23) and is a type I transmembrane protein with 20% amino acid identity to B7.1 and 15% amino acid identity to B7.2. Costimulation of T cells with B7-H1-Fc fusion protein has been shown to induce T cell proliferation and secretion of IL-10 and IFN-γ, but minimal IL-2 (23). Recently, contrary data have been presented suggesting that B7-H1 (programmed death-1 ligand (PD-L)1) negatively regulates cytokine synthesis (24, 27). Programmed death-1 (PD-1) was identified as a receptor for PD-L1 and contains an immune receptor tyrosine-based inhibitory motif (ITIM). Coligation of PD-1 and the TCR leads to rapid phosphorylation of SHP-2, a phosphatase suggested to attenuate TCR signaling (28). Moreover, animals deficient in PD-1 succumb to autoimmune disorders, including dilated cardiomyopathy (29). In humans, B7-H1 has been shown to be expressed on a subset of PHA-activated T cells, on IFN-γ- and LPS-activated monocytes (23), and on IFN-γ-treated keratinocytes (24). A second ligand for PD-1, PD-L2, was recently described and has a broadly similar distribution (30). In this study, we have addressed two questions: first, whether B7-H1 is expressed by human ECs; and, second, whether B7-H1 expression by APC promotes or inhibits T cell cytokine synthesis. We find that B7-H1 is inducible on human ECs by IFN-γ, both in vitro and in vivo, and that inhibiting B7-H1 interaction with its receptor on T cells, PD-1, augments T cell cytokine synthesis. rIFN-γ (supplied by units) and TNF-α (supplied by weight) were obtained from BioSource International (Camarillo, CA). mAb to B7-H1 and plasmids pcDNA3-B7-H1 and PD-1-Ig were provided by L. Chen (Mayo Clinic, Rochester, MN). The control Ab, HB64, was isolated from the hybridoma clone obtained from the American Type Culture Collection (Manassas, VA). Anti-VCAM-1 and anti-ICAM-1 Abs were from the Developmental Studies Hybridoma Bank (University of Iowa, IA). Goat anti-mouse Ig FITC was from Jackson ImmunoResearch Laboratories (West Grove, PA). Directly conjugated Abs to CD3, CD69, and CD25 were from BD Biosciences (Mountain View, CA). PHA was obtained from Sigma-Aldrich (St. Louis, MO). HUVECs were isolated from umbilical veins and cultured as described previously (19) on 1% gelatin-coated tissue culture plastic in medium 199 (M199) supplemented with 20% FBS, antibiotics (all from Life Technologies, Grand Island, NY), endothelial growth supplement (Collaborative Biomedical Products, Bedford, MA), and heparin (Sigma-Aldrich). Lung microvascular ECs (LUMVECs) were purchased from Clonetics (Walkersville, MD). SMCs were cultured from umbilical artery explants grown in M199 with 10% FBS and antibiotics. Skin fibroblasts were purchased from ATCC and were grown in the same medium as the SMC. Purified T cells were prepared from peripheral blood as previously described (3). Cells were grown until confluent on 100-mm dishes and treated with IFN-γ and/or TNF-α at the concentration indicated for 4–24 h. Total RNA was isolated using TRIzol reagent (Life Technologies). For Northern analysis, 20 or 30 μg RNA was electrophoresed on a 1.2% agarose-formaldehyde gel and then transferred to a nylon membrane using a Turboblotter (Schleicher & Schuell, Keene, NH). Blots were preincubated in hybridization solution (50% formamide, 1% SDS, 5× SSC, 5× Denhardt’s solution, 2.5% dextran sulfate, and 100 μg/ml denatured salmon sperm DNA) for 1 h at 42°C and then hybridized at 42°C overnight in hybridization solution with 1 × 106 cpm/ml of a [α-32P]dATP-radiolabeled DNA probe. Probes were prepared by random priming either the full-length B7-H1 cDNA or a PCR fragment of GAPDH (Decaprime II kit; Ambion, Woodward, TX). Blots were exposed to autoradiography film for 7–75 h or were analyzed on a PhosphorImager (Molecular Dynamics, Sunnyvale, CA). ECs (2 × 105) were treated for 24 h with saturating doses of IFN-γ (100–1000 U/ml) and/or TNF-α (10 ng/ml). Cells were washed with HBSS, trypsinized, and washed with 1× PBS/1% BSA. Cells were then incubated with 5 μg/ml B7-H1 mAb or HB64 control mAb in 1× PBS/1% BSA/1% goat serum for 30 min on ice, washed in 1× PBS/1% BSA, and incubated with goat anti-mouse Ig FITC (1:200) for 30 min on ice. Finally, cells were washed once with 1× PBS/1% BSA, once with 1× PBS, resuspended in 500 μl of 1× PBS, and analyzed immediately on a FACSCalibur (BD Biosciences). ECs were grown to 70% confluence in 24-well plates and then transfected with 0.25 μg/24-well of the indicated plasmid using Lipofectamine and Plus reagent, according to the manufacturer’s protocol (Life Technologies). Cells were rested overnight, then purified T cells and PHA at various concentrations were added. These cocultures were incubated for 48 h, after which supernatants were harvested for quantification of cytokines by ELISA. All cytokine ELISA kits were from R&D Systems (Minneapolis, MN). An antisense morpholino oligonucleotide, specific for human B7-H1, was designed and synthesized by GeneTools (Corvallis, OR). The invert of this was used as a control. To load ECs with the morpholinos, cells were washed and then incubated with 1.4 μM antisense or invert along with EPEI special delivery reagent diluted in OptiMEM, according to the manufacturer’s instructions. After a 3-h incubation, cells were washed and then rested in medium for 4 h. Control experiments using a FITC-labeled morpholino indicated that essentially all cells took up the oligonucleotide, yielding a single peak by FACS (data not shown). Purified T cells (5 × 105/24-well) and PHA were then added, and the plates incubated for 24 h. Supernatants were then harvested for quantification of cytokines by ELISA. Human skin was obtained from discarded elective surgery material under protocols approved by the Institutional Review Board (Irvine, CA). Small blocks (2 × 2 × 3 mm) of tissue were maintained for 24 h, either in medium or medium containing IFN-γ (1000 U/ml) and TNF (10 ng/ml), and then harvested, snap-frozen, and cryosectioned. Sections (10 μm) were incubated for 1 h with either control mAb (HB64) or with mAb to B7-H1 or CD31, washed, and then incubated with a universal secondary Ab (Vector Laboratories, Burlingame, CA), followed by detection with an ABC Elite kit (Vector Laboratories). To determine whether B7-H1 is expressed by human ECs, we performed Northern blot analysis. Total RNA was isolated from untreated ECs or from ECs treated with either IFN-γ (1000 U/ml) or TNF-α (10 ng/ml) for 20 h. As shown in Fig. 1⇓A, B7-H1 RNA was detectable in ECs treated with IFN-γ, but not in resting or TNF-α-treated ECs. In some cultures, very low levels of transcript are apparent in resting cells, perhaps reflecting donor variability. A prominent transcript of 4.1 kb was observed; however, we did not see the 7.2-kb transcript seen in some human tissues (23). Interestingly, we also observed a smaller transcript of 1.8 kb, present at much lower levels and only apparent after longer exposures (see Fig. 3⇓A). This smaller transcript is also present in the multiple tissue northern blot published by Freeman et al. (24). Expression of B7-H1 is induced by IFN-γ in ECs. A, Northern blot analysis was performed using total RNA (20 μg) isolated from ECs incubated without cytokines (lane 1), with 1000 U/ml IFN-γ (lane 2), or with 10 ng/ml TNF-α (lane 3) for 20 h. The blot was hybridized with a probe for B7-H1, then stripped and rehybridized with GAPDH probe to demonstrate equal loading of RNA in all lanes. A major transcript of 4.1 kb is apparent for B7-H1. One of three similar experiments. B, Northern blot analysis was performed using total RNA (30 μg) from ECs treated with either no cytokines or various combinations of IFN-γ (units per milliliter) and TNF-α (nanograms per milliliter) for 12 h. The blot was hybridized with a B7-H1 probe, stripped, and rehybridized with a GAPDH probe. Shown below are the levels of RNA on the blot quantitated on a PhosphorImager; background was subtracted from the B7-H1 values and these were normalized to GAPDH expression. One of two similar experiments. C, ECs were treated with no cytokines, with IFN-γ (1000 U/ml) or TNF-α (10 ng/ml), or with both cytokines for 20 h. Cells were stained with a control Ab (open histograms) or B7-H1 mAb (filled histograms). Numbers represent the mean fluorescence intensity of B7-H1 staining with the background mean fluorescence intensity subtracted. One of two similar experiments. Cytokines regulate the expression of numerous immunoregulatory molecules, both temporally and quantitatively, thus allowing for fine tuning of the immune response. In many cases, cytokines act cooperatively to enhance the induction of these molecules. Although B7-H1 was induced by IFN-γ but not by TNF-α, we wanted to determine whether its expression was synergistically induced by these cytokines. Northern analysis was performed on ECs treated with various concentrations of IFN-γ and TNF-α, either alone or in combination. As shown in Fig. 1⇑B, IFN-γ and TNF-α, when used in combination, had a greater than additive effect on the level of B7-H1 mRNA induced. 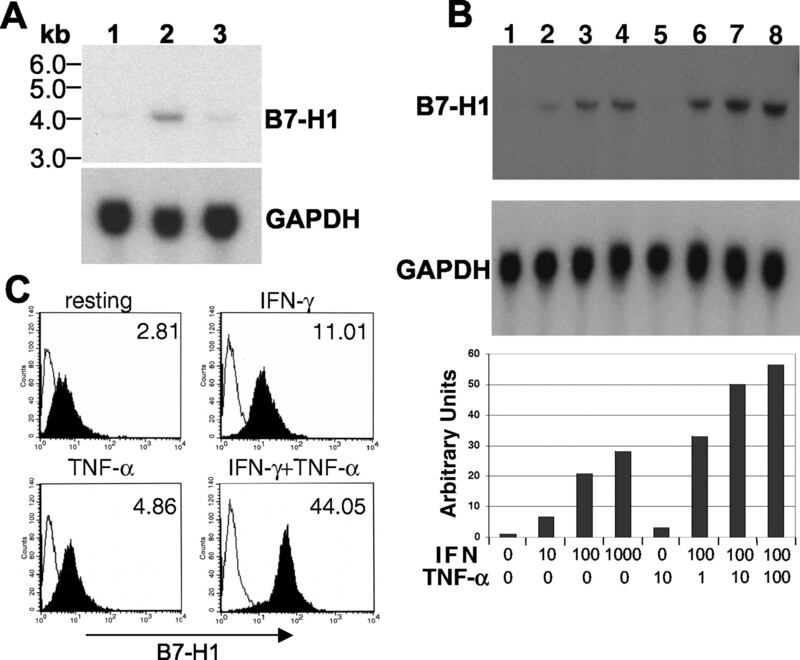 IFN-γ alone induced B7-H1 RNA in a dose-dependent manner, whereas TNF-α alone was ineffective at any concentration (Fig. 1⇑B). A combination of 100 U/ml IFN-γ and 1, 10, or 100 ng/ml TNF-α induced a 2-fold increase over the additive effect of IFN-γ and TNF-α used alone. We next examined the effect of IFN-γ and TNF-α on the levels of B7-H1 protein expressed by ECs. ECs were treated with IFN-γ and TNF-α, either alone or in combination, for 20 h and then analyzed by FACS using a B7-H1-specific Ab. Consistent with our Northern data, IFN-γ and TNF-α in combination had a 3-fold greater than additive effect on the expression of B7-H1 (Fig. 1⇑C). Resting or TNF-treated ECs express little to no B7-H1 on their surface, and the induction by combined cytokine treatment is homogenous across the EC population. The expression of B7.1 and B7.2 is temporally regulated, with B7.2 being induced much more rapidly. To determine the kinetics of induction of B7-H1 on ECs, cells were left untreated or were treated with IFN-γ and TNF-α, either alone or in combination, and then harvested at various times for Northern analysis. B7-H1 RNA was expressed by ECs as early as 4 h in ECs treated with IFN-γ. Expression peaked between 8 and 12 h and remained high at 24 h (Fig. 2⇓A). Protein levels remained high out to at least 72 h (Fig. 2⇓B). The use of IFN-γ and TNF-α in combination did not affect the kinetics of expression of B7-H1 (Fig. 2⇓A). Time course of B7-H1 RNA and protein induction in ECs. A, Northern blot analysis was performed using total RNA (30 μg) isolated from ECs treated with 1000 U/ml IFN-γ, 10 ng/ml TNF-α, or both cytokines for 4, 8, 12, and 24 h. The blot was hybridized with a probe for B7-H1, stripped, and rehybridized with a GAPDH probe to demonstrate equal loading of RNA in all lanes. Shown below are the levels of RNA on the blot induced with IFN-γ (dotted line), and IFN-γ and TNF-α (solid line) quantitated on a PhosphorImager; background was subtracted from the values and these were normalized to GAPDH expression. One of two similar experiments. B, ECs were treated with no cytokines (filled histogram and solid line) or 1000 U/ml IFN-γ for 24, 48, and 72 h (dotted and dashed lines). Cells were stained with a control Ab (filled histogram) or B7-H1 mAb (solid, dotted, and dashed lines), and analyzed by FACS. One of two similar experiments. Having established the inducible expression of B7-H1 in large vessel ECs (HUVECs), we next wished to examine its expression by microvascular ECs as well as by stromal cells. HUVECs, LUMVECs, SMCs, or fibroblasts were left untreated or were treated with IFN-γ and TNF-α, either alone or in combination for 20 h, and then harvested for analysis by Northern blot. B7-H1 RNA was expressed by all the cell types tested when treated with IFN-γ, or a combination of IFN-γ and TNF-α (Fig. 3⇓). 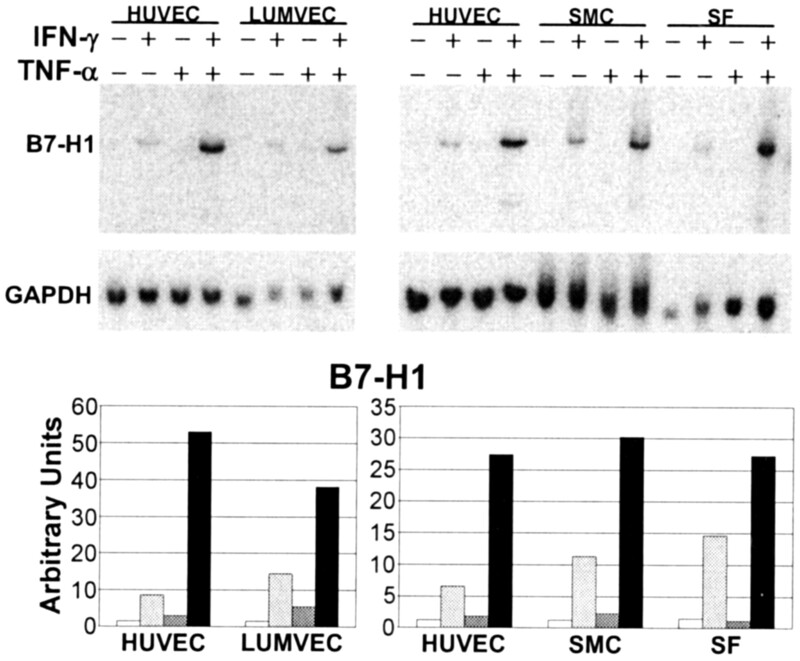 The expression of B7-H1 by HUVECs, LUMVECs, SMCs, and fibroblasts. Northern blot analysis was performed using total RNA (22.5 μg) isolated from HUVECs, LUMVECs, SMCs, and fibroblasts treated with 1000 U/ml IFN-γ, 10 ng/ml TNF-α, or both cytokines for 20 h. The blot was hybridized with a probe for B7-H1, stripped, and rehybridized with a GAPDH probe to demonstrate equal loading of RNA in all lanes. Shown below are the levels of RNA on the blot quantitated using a PhosphorImager; background was subtracted from the values and these were normalized to GAPDH expression. One of two similar experiments. We and others have previously reported that ECs provide costimulation to resting T cells, resulting in cytokine synthesis. ECs stimulate memory but not naive cells and promote the expression of IL-2 and IFN-γ, but not IL-4 (3, 4). Recently, conflicting reports have appeared on the role of B7-H1 during T cell activation, and in particular, whether it mediates positive (costimulatory) or negative signals (23, 24). In part, this conflict may be due to the use of B7-H1-Fc fusion proteins, either in soluble form or bound to plates or beads. Under different conditions, binding of the fusion proteins to PD-1 (the B7-H1 receptor on T cells) may be blocking or stimulatory. To avoid these problems we have used PD-1-Fc fusion protein, which we believe acts as a more reliable dominant negative. This reagent binds B7-H1 on the APC and blocks receptor-ligand interactions, thereby avoiding the potential for direct signaling through PD-1. 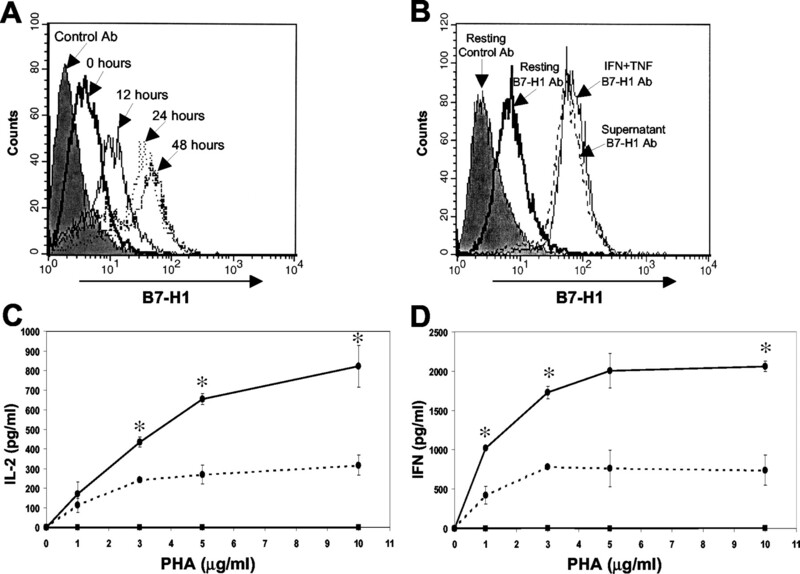 In a preliminary series of experiments, we established that PHA-activated T cells, cocultured with ECs, induce significant expression of B7-H1 on ECs (Fig. 4⇓A). Furthermore, supernatants removed from 24-h cocultures of T cells and ECs are equally as effective as cytokines in inducing B7-H1 on resting ECs (Fig. 4⇓B). ECs were then transfected with either control plasmid or expression plasmids encoding dominant negative PD-1, or full-length B7.2, which we used as a positive control. Cells were cultured in various concentrations of PHA, which we used as a primary stimulus, and supernatants were harvested at 48 h for analysis of cytokine secretion. Under these conditions, B7.2-expressing ECs strongly enhanced T cell secretion of both IL-2 and IFN-γ (at a PHA concentration of 10 μg/ml, control-transfected ECs induced 317 U/ml IL-2 and 741 U/ml IFN-γ, while B7.2-transfected ECs induced 3580 U/ml IL-2 and 3822 U/ml IFN-γ). Interestingly, we find that blocking B7-H1-PD-1 interactions also enhances expression of these cytokines (Fig. 4⇓, C and D). This suggests that B7-H1 mediates a negative signal in this system; data that are consistent with previous reports that PD-1, possibly through its ITIM motifs, mediates a negative regulatory signal for T cell activation and cytokine synthesis (31). Although secretion of both IL-2 and IFN-γ were augmented when B7-H1 signaling was blocked, we did not see a consistent effect on IL-10 secretion (data not shown). Blocking the interaction of B7-H1 with its receptor, PD-1, increases T cell cytokine synthesis. A, ECs were cocultured for various times with purified T cells and 5 μg/ml PHA. Cells were then stained with a control Ab (filled histogram) or a monoclonal B7-H1 Ab (solid, dotted, and dashed lines) and analyzed by FACS. One of two similar experiments. B, ECs were incubated either in fresh medium (filled histogram and bold line), media preconditioned for 24 h by an activated T cell/EC coculture (dashed line), or with 1000 U/ml IFN and 10 ng/ml TNF (thin line) for 20 h. Cells were stained with a control Ab (filled histogram) or a monoclonal B7-H1 Ab (bold, thin, and dashed lines) and analyzed by FACS. C, ECs transfected with vector (dashed line) or PD-1Ig fusion expression plasmid (solid line) were incubated with purified T cells and various concentrations of PHA for 48 h. Supernatants were harvested and analyzed by ELISA for the presence of IL-2. D, Supernatants were harvested as above and analyzed by ELISA for the presence of IFN-γ. As a positive control, ECs were also transfected with a B7.2 expression plasmid, which at a PHA concentration of 10 μg/ml induced 3580 pg/ml IL-2. Error bars represent SEM; where absent, the error bar was smaller than the symbol. ∗, Significantly different from control (p < 0.05 by Student’s t test). One of two similar experiments. An alternative strategy to examine the function of molecules is to reduce their expression at the translational level. To achieve this, we used morpholino antisense oligonucleotides to specifically block translation and expression of B7-H1 protein. To monitor the effectiveness of the antisense molecules, ECs pretreated with either antisense or invert sequences were stimulated with IFN-γ and TNF-α and harvested after 24 h for analysis by FACS (Fig. 5⇓A). We consistently saw a 70–85% decrease in mean fluorescence intensity in antisense vs invert controls, indicating that the antisense molecules effectively blocked B7-H1 translation. Neither antisense nor invert had any effect on induced expression of ICAM-1 or VCAM-1 (Fig. 5⇓B), indicating that the antisense is specific for B7-H1 and does not globally suppress translation. Reduction of B7-H1 expression by morpholino antisense augments the secretion of cytokines by T cells. 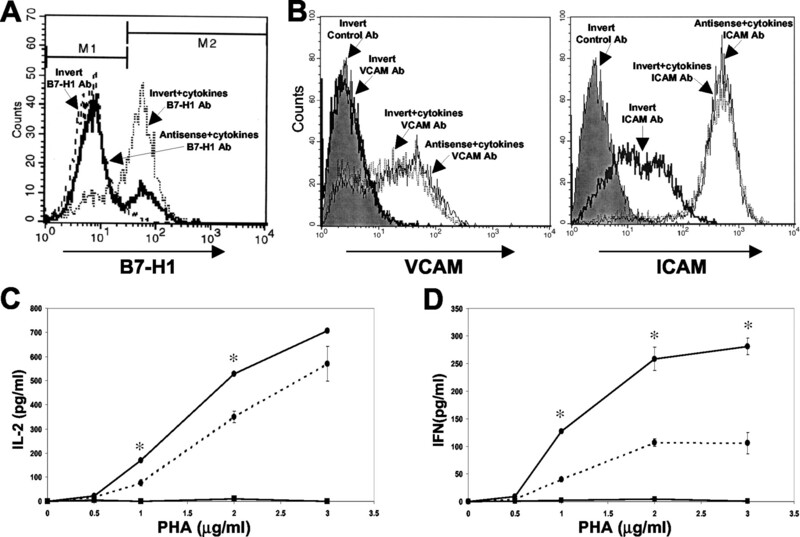 A, FACS analysis of B7-H1 expression on antisense or invert-treated ECs. Cells were pretreated with B7-H1 morpholino antisense (solid line) or invert (dotted and dashed line) oligonucleotides for 3 h, rested, and then stimulated overnight with (solid and dotted line) or without (dashed line) IFN-γ (1000 U/ml) and TNF-α (10 ng/ml). Cells were then stained with a monoclonal B7-H1 Ab and analyzed by FACS. Antisense reduces B7-H1 mean fluorescence intensity by >85%, although a subpopulation of cells is not affected. B, ECs were pretreated with B7-H1 morpholino antisense or invert oligonucleotides for 3 h, rested, and then stimulated for 24 h with or without 1000 U/ml IFN-γ and 10 ng/ml TNF, as indicated. Cells were then stained with a control Ab, or a VCAM-1 or ICAM-1 Ab, as indicated, and analyzed by FACS. C, Antisense morpholino-treated (solid line) and invert morpholino-treated (dashed line) ECs were incubated with purified T cells and various concentrations of PHA for 24 h. Supernatants were harvested and analyzed by ELISA for the presence of IL-2. D, Supernatants were harvested as above and analyzed by ELISA for IFN-γ. Purified T cells were incubated without ECs (▪) as a negative control. Error bars represent SEM; where absent, the error bar was smaller than the symbol. ∗, Significantly different from control (p < 0.05 by Student’s t test). One of three similar experiments. ECs treated with B7-H1 antisense or invert morpholinos were incubated with T cells and various concentrations of PHA for 24 h, at which time supernatants were harvested for analysis of cytokine secretion. Consistent with our experiments using dominant negative PD-1, blocking B7-H1 expression increased secretion of both IL-2 and IFN-γ (Fig. 5⇑, C and D). We found increases of ∼2- to 3-fold for IFN-γ, with more modest increases of 25–50% for IL-2. Again, we did not see a consistent difference in expression of IL-10 when B7-H1 signaling was reduced (data not shown). The more modest increases seen with antisense treatment compared with the expression of dominant negative PD-1 may relate to the possible presence of alternative ligands for the PD-1 receptor on ECs. A second ligand (PD-L2) was recently reported (30), and whereas antisense to B7-H1 (PD-L1) would not reduce PD-L2 expression, the PD-1 fusion protein would bind and block both ligands. Interestingly, over the course of several dose-response experiments, we failed to see an enhanced effect of B7-H1-PD-1 interaction at lower levels of TCR stimulation, as has been reported previously (24, 30). Rather, our data suggest that B7-H1-PD-1 interaction suppresses cytokine synthesis proportional to the strength of the primary stimulus (Figs. 4⇑ and 5⇑). These data are consistent with a role for B7-H1 in setting thresholds for T cell activation (see Discussion). We wondered whether B7-H1 signals generally suppressed T cell activation or whether the signal was more specific. To investigate this, T cells were cultured with morpholino-treated ECs as described above and then harvested for analysis of CD3, CD25, and CD69 expression. CD69 is rapidly induced on activated T cells, whereas CD25—the high affinity IL-2R—appears more slowly. T cells were analyzed at both early and late times after activation and no significant differences in expression of CD25 or CD69 were seen when the cells were activated by invert or antisense-treated ECs (Table I⇓). These data suggest that B7-H1 signaling by ECs affects the level of T cell cytokine expression, but does not affect other aspects of activation as assessed by induction of the activation markers CD25 and CD69. To examine the expression of B7-H1 under inflammatory conditions, we used a previously described ex vivo model whereby small biopsies of normal skin are cultured overnight in medium or medium containing cytokines (32). Under these conditions, inflammatory markers such as E-selectin and VCAM-1 can be reliably induced on ECs. A control mAb did not stain untreated or treated tissue (Fig. 6⇓, A and B); however, blood vessels were easily detected in untreated skin using a CD31 mAb (Fig. 6⇓C). B7-H1 was barely detectable in untreated skin, with only keratinocytes and occasional vessels showing very weak staining (Fig. 6⇓D). In contrast, there was a significant up-regulation of B7-H1 on inflamed vessels induced by IFN-γ and TNF-α (Fig. 6⇓, E and inset). Furthermore, it appears that B7-H1 may only be present on a subset of vessels as fewer vessel profiles were apparent than were detected using the CD31 mAb (compare Fig. 6⇓, C–E). B7-H1 is expressed by microvessels in inflamed human skin. Human skin tissue blocks (2 × 2 × 3 mm) were incubated either in medium or in medium with IFN-γ (1000 U/ml) and TNF-α (10 ng/ml) for 24 h. Tissue was frozen and 10-μm sections were cut. 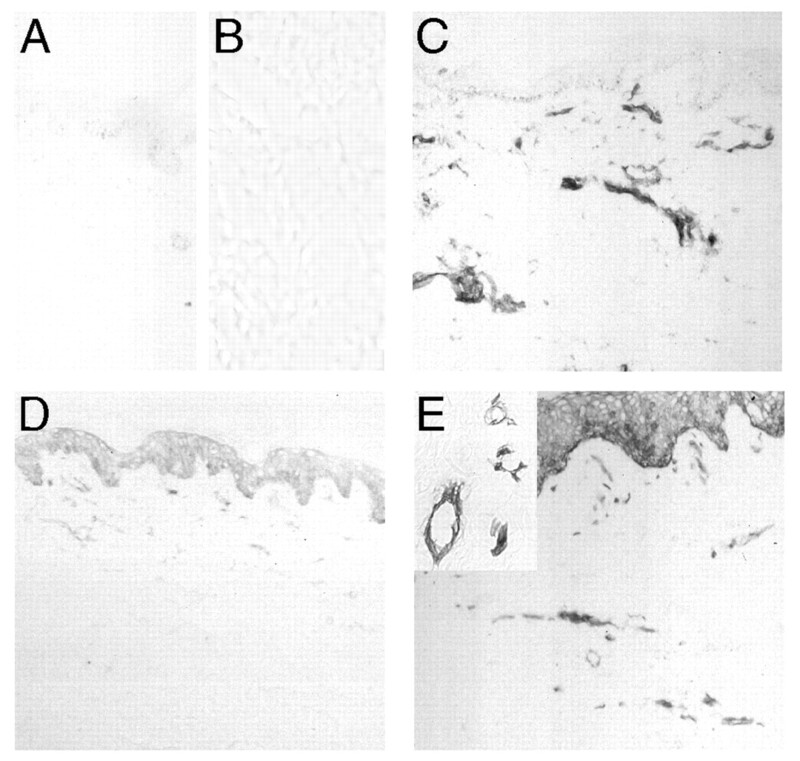 Sections were stained with: A, Control mAb (HB64) on resting skin; B, control mAb (HB64) on cytokine-treated, inflamed skin; C, CD31 mAb on resting skin; D, B7-H1 mAb on resting skin; or E, B7-H1 mAb on cytokine-treated, inflamed skin. Original magnification was ×100, except E, inset, which was ×400. This study has answered two questions. First, we have shown that ECs, both in vitro and in vivo, can be induced to express B7-H1 in response to inflammatory stimuli. Second, we have shown that B7-H1 expressed by ECs transmits a negative signal to T cells, resulting in down-regulation of cytokine synthesis. There is now a mounting body of evidence supporting the contention that human ECs have an important role in initiating and shaping immune responses in the periphery (4, 5, 6), although there are also data suggesting otherwise (33, 34). The costimulatory and regulatory molecules used by ECs have not been well-defined. Neither resting nor activated ECs express the costimulatory molecules B7.1 and B7.2; however, there is some evidence that EC costimulation may involve B7 acting in trans (20). A receptor for B7-H1 (PD-L1) was recently identified on activated T cells and shown to be identical with PD-1 (24). PD-1 is weakly homologous to CTLA-4 and contains an ITIM, suggesting that it may serve an inhibitory function during T cell activation. In support of this, PD-1 knockout mice develop a lupus-like arthritis and glomerulonephritis, as well as augmented B cell proliferation (35). In addition, they develop an autoimmune-dilated cardiomyopathy (29). These data suggest that B7-H1 may serve to maintain peripheral tolerance by acting as a counter influence to costimulation through other members of the CD28 family (31). However, it should be noted that B7-H1 has also been shown to provide positive signals for T cell proliferation and cytokine synthesis (23). The basis for these conflicting findings has yet to be determined. We find that B7-H1 is rapidly induced on HUVECs by IFN-γ, a result in line with recent data showing induction of B7-H1 on mouse ECs (36). In light of the significant differences between mouse and human immunology as it relates to the endothelium, it is not clear yet what might be the significance of this finding. We have identified a putative promoter region for human B7-H1 in the High throughput genomic sequencing database, and consistent with its inducibility by IFN-γ, it contains several IFN-γ-responsive elements, including an IFN stimulation response element and several IFN regulatory factor motifs (our unpublished observations). Our finding of induced expression of B7-H1 on ECs, both in vitro and in vivo, suggests that this molecule may serve an immunomodulatory function at the vessel wall. Importantly, by avoiding the potential pitfalls associated with the use of ligand-Ig fusion proteins, and using antisense and receptor-Ig fusion proteins, we have shown unequivocally that blocking of B7-H1 on ECs leads to augmented IL-2 and IFN-γ synthesis in vitro, implicating this molecule as a physiologic inhibitor of T cell activation at the vessel wall in vivo. Freeman and colleagues (24, 30) have proposed that B7-H1 (PD-L1) may be involved in setting thresholds for activation in the periphery. We have previously reported that ECs lie along a spectrum of Ag presenting ability and are able to activate resting CD45RO memory T cells but not CD45RA naive T cells. Moreover, we found distinct thresholds for activation of CD69 expression and IFN-γ and IL-2 synthesis (3). A balance must be met in the periphery between tolerance and the ability to rapidly induce recall responses. This likely involves the setting and maintaining of finely tuned thresholds. TNF-inducible expression of the costimulatory molecule inducible costimulator (ICOS) ligand (GL50/B7RP-1/B7 h/LICOS) on cultured ECs has recently been reported (37), and we have confirmed this finding (our unpublished observations). Expression of ICOS ligand along with CD58 promotes T cell activation by ECs (37). In the absence of B7.1 and B7.2 expression on human ECs, the combination of CD2 and ICOS ligation by CD58 and ICOS ligand, respectively, may be sufficient to promote T cell activation in the presence of moderate doses of Ag. There may also be a contribution late in the response from B7 expressed on T cells (20). At lower doses of Ag, the suppressive effects of B7-H1 may limit local IL-2 synthesis to a level insufficient to support T cell activation and expansion. Similarly, limiting the level of IFN-γ may reduce EC expression of adhesion, MHC and costimulatory molecules, and may also reduce local activation of macrophages. There may also be reduced expression of T cell activation markers, although this was not observed in our experiments. In vivo, where blood flow through tissue can limit local accumulation of cytokines, the immediate level of synthesis will acutely affect the level of cytokines experienced by extravasated leukocytes, thus a complex interplay between the concentration of Ags, the density of MHC molecules, and the expression of costimulatory and inhibitory molecules will act to set the threshold for peripheral T cell activation (3). Expression by ECs of different combinations of molecules mediating EC-T cell interactions, such as CD58, B7-H1, ICOS ligand, OX40 ligand (38), and CD40 (39) may be important in shaping immune responses under different conditions. We have shown that the initial phase of T cell activation in response to Ag presentation by ECs involves synthesis of IL-2 and IFN-γ, but not IL-4 (3). Over the first 24 h, very little IL-10 is synthesized; however, by 48 h, substantial quantities of IL-10 are secreted. IL-10 can down-regulate IL-12 synthesis and may skew a response more toward a Th2 type. However, we did not see evidence of this, suggesting either that the combination of costimulatory molecules expressed by ECs favors a more Th1-like response, or that Th2 cytokines may be expressed later, a possibility consistent with the reported requirement for several rounds of division before primed T cells express IL-4 (40). Somewhat surprisingly, we did not see a consistent role for B7-H1 in modulating IL-10 synthesis (23, 24). In some experiments, blocking B7-H1-PD-1 interaction resulted in substantial increases in IL-10 synthesis, whereas in other cultures there was no effect, even though IL-2 and IFN-γ were significantly augmented (data not shown). It is possible that this relates to donor differences, as both the ECs and T cells are from multiple donors. In addition to B7-H1 and ICOS ligand, two other B7-like molecules have recently been cloned. PD-L2 is a second ligand for PD-1 (30) and seems to have a similar function. B7-H3 is expressed on dendritic cells and appears to be a costimulatory molecule for IFN-γ synthesis (41). Interestingly, we found evidence supporting an alternative form of B7-H1 expressed on ECs, although we have not confirmed this directly. The antisense morpholinos completely blocked B7-H1 expression on >70% of cells, but did not affect expression on the remaining cells. We found no heterogeneity in uptake of the morpholino, suggesting that the heterogeneity lies at the level of mRNA or protein expression. We have identified a shorter transcript on Northern blots and several ESTs exist that code for a shorter protein, beginning at an alternative initiation codon. Translation of this protein would not be inhibited by the morpholino we used. Additional experiments are required to confirm expression, and to determine the functional relevance of this putatively truncated protein. In summary, our data show that expression of B7-H1 is inducible on ECs, both in vitro and in vivo. Furthermore, B7-H1 negatively regulates T cell synthesis of IL-2 and IFN-γ, and possibly IL-10, but does not affect expression of T cell activation markers in vitro. In conjunction with in vivo studies (29, 35), our data suggest that expression of B7-H1 in the periphery may regulate local levels of immune inflammation. We thank Dr. Lieping Chen for the B7-H1 mAb and cDNA. We thank Reza Azanchi and Martin Nakatsu for excellent technical assistance. ↵1 This work was supported by a grant from the National Institutes of Health (RO1 AI40710). ↵3 Abbreviations used in this paper: EC, endothelial cell; LUMVEC, lung microvascular EC; SMC, smooth muscle cell; PD-1, programmed death-1; ITIM, immune receptor tyrosine-based inhibitory motif; PD-L, programmed death-1 ligand; ICOS, inducible costimulator.